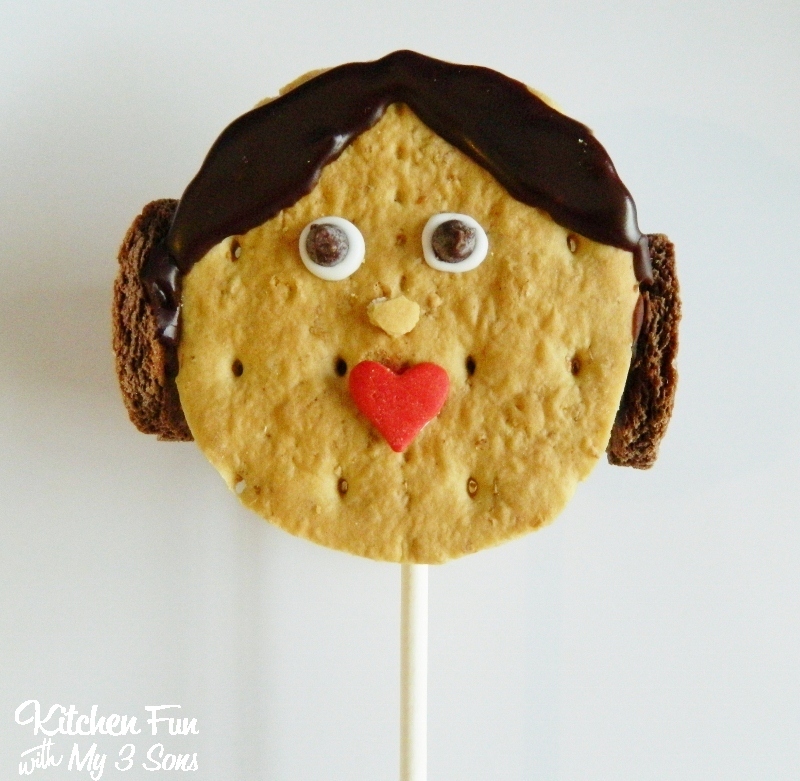 We are on Day 3 of our Star Wars S’mores creations that we will be sharing with you this week! 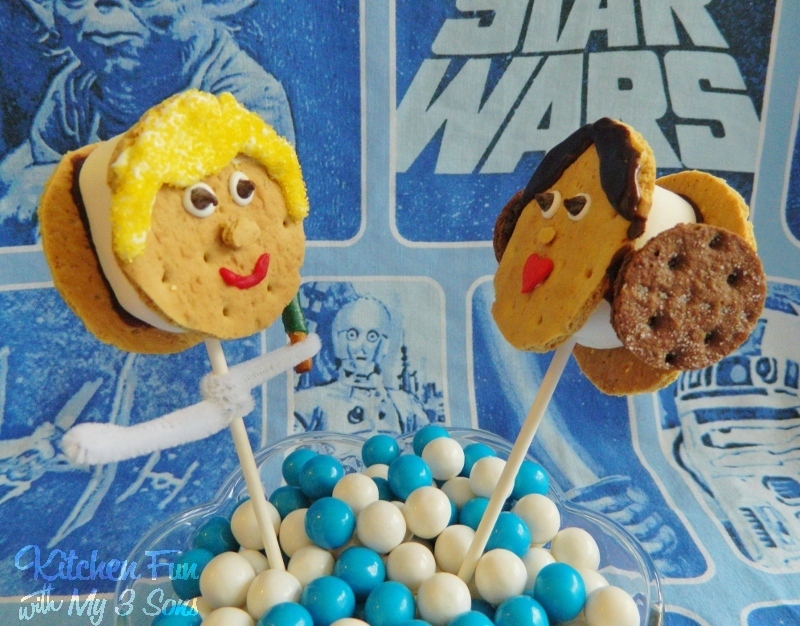 We decided to include a Luke S’morewalker Pop and a Princess Leia S’more Pop! 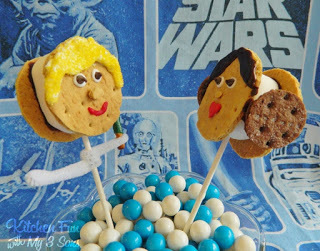 Make sure to check out our other fun S’mores Wars pops that we have already shared! Cut 2 circles out of the graham crackers using kitchen scissors or a round cookie cutter. Cut the jumbo marshmallow in half. 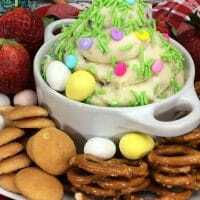 Squeeze chocolate cookie frosting on both sides of the marshmallow and place in between the graham crackers. We added white frosting for the hair and yellow sprinkles. 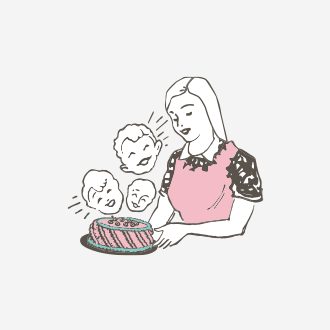 You could also add brown sprinkles. Looks hair is a dirty blonde so either will work. We used white frosting for the eyes and mini chocolate chips for the pupils. 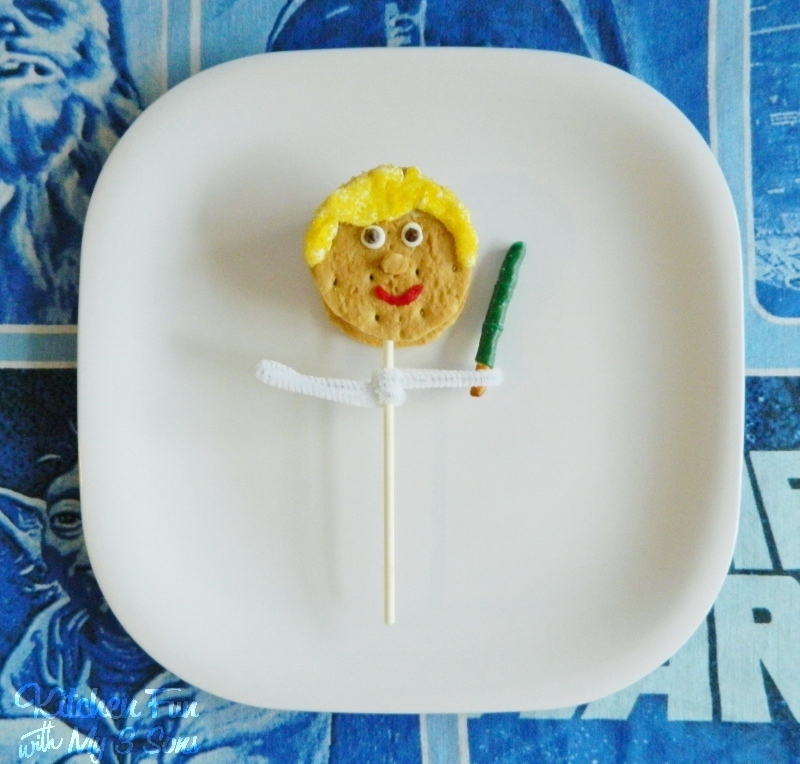 We used red frosting for the mouth and cut out a nose from the graham cracker scraps. We poked a lollipop stick in the bottom of the marshmallow. We wrapped a white pipe cleaner around the stick for arms. We wrapped a piece of the green fruit roll up around a pretzel stick and placed it in the hand of the pipe cleaner. 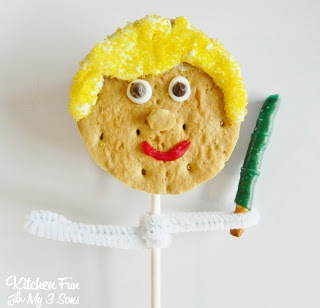 Cut 2 circles out of the graham crackers using kitchen scissors or a round cookie cutter. Cut a jumbo marshmallow in half and squeeze chocolate cookie frosting on both sides. Place in between the graham crackers. We used chocolate cookie frosting for her hair. We cut out 2 small circles from a chocolate graham cracker and attached them on the sides with chocolate frosting for her buns. We used white frosting to make her eyes and mini chocolate chips for the pupils. We used a small heart candy sprinkle for her mouth. Poke a lollipop stick in the bottom of the marshmallow. We have already shared Yoda, Jawa, Chewbacca, Darth Vader, Storm Trooper S’mores Pops and we have more to come! 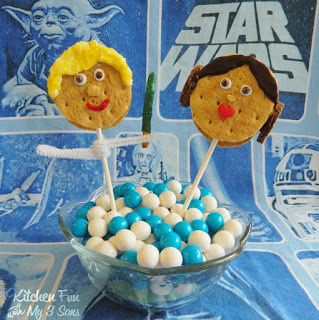 We have made a ton of other Star Wars fun food and you can check them out HERE! MAY THE S’MORES BE WITH YOU!!! « Previous PostStar Wars S’mores Pops …Day 2! 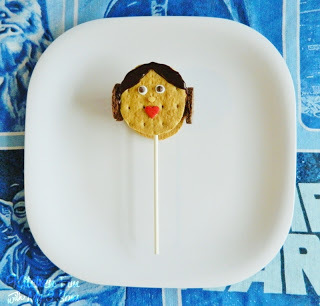 Next Post » Star Wars S’mores…Day 4! 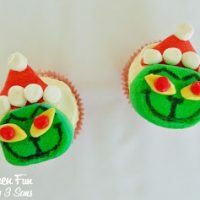 Grinch Marshmallow Cupcake Toppers..super easy! Melted Snowman S’mores with Christmas Party ideas for Kids! Love it! Looks so easy.